'AduraVilla' 4 Bed Exec Villa at the Sanctuary, near Champions gate. This beautiful 4 bedroomed villa is located at one of the most sought after locations at The Sanctuary at West Haven. Located in a superb gated community of high quality homes and set in beautifully landscaped communal areas. This is a relatively large villa, with 1989 sq ft of space, excluding the pool area and large Lanai. This villa has its own private Swimmimg Pool and spa. When the sun gets too much, for those guests wanting some shade there is a large covered Lanai . With ample Patio Furniture as well as a plush 4-seater dining table, the lanai also provides a nice area to eat meals al fresco or to sit and relax with an evening drink and watch the sun set. . For the safety of children the outside deck area is equipped with a Pool Guard . 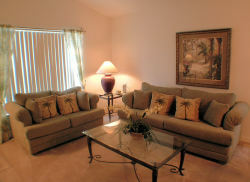 The large Family Room is a real showpiece with brand new furniture. There is also a Games Room to provide hours of entertainment and challenges for everyone! The fully equipped Kitchen with oven, hob, microwave, dishwasher, American fridge/freezer/icemaker,waste-disposal unit and double sink will more than cater for all your needs. Adjacent is a Breakfast Nook with table and chairs. The kitchen also incorporates a breakfast bar with further seating. For your convenience, there is a washing machine, tumble drier, iron and ironing board in a separate Utility Room . All linen and towels are provided for your convenience. A separate Dining Area will seat six people. This really is a magnificent setting for formal dining, and should you wish to escape somewhere quieter there is a Second Lounge area with double sofabed and a large coffee table. This lies beyond the dining area for extra privacy. The Master Bedroom really is something to behold! The luxurious En-suite Bathroom has two single bowl vanity units, a toilet (separated from the remainder of the bathroom by its own door), a large roman bath and a huge walk-in shower cubicle. Also in the bathroom area are two large walk-in closets. Master Bedroom 2 is again fully furnished with a Queen-size feature bed. Patio doors running the length of the room give you your own personal access to the deck and pool area. This bedroom also has its own en-suite bathroom with an annexed door. There are 2 Two Twin Bedrooms that the kids or young at heart will love. Both these rooms share a bathroom. 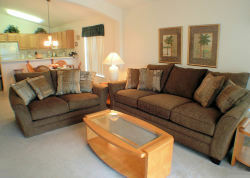 If you are looking for a great villa to relax in after a hectic day at the parks. The Sanctuary is an impressive gated community of high quality homes set in beautifully landscaped communal areas. Red stone paving driveways and tree-lined boulevards add elegance to the development. The world-renowned Championsgate golf resort featuring two 18-hole courses designed by Greg Norman is a mere two minutes drive from your vacation villa. The Sanctuary Villa is situated in a quiet rural location and offers easy access to Disney World, which will take 15 minutes by car and is also well placed for all the other major attractions in the Disney area.